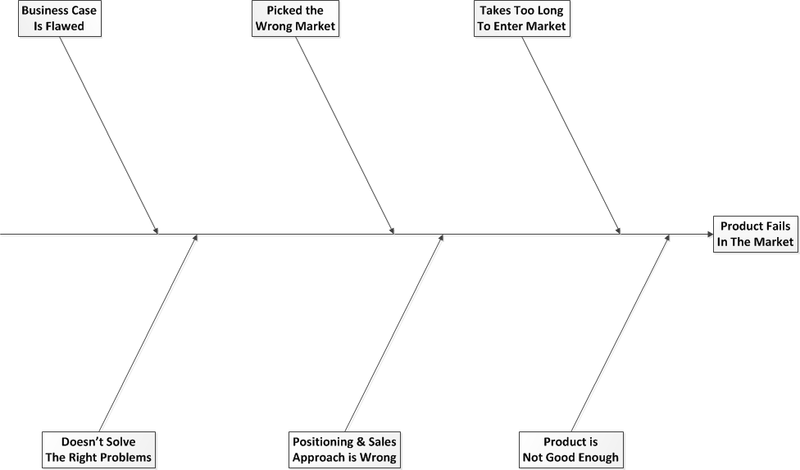 In the first article on why products fail, I started with the top-down categorization of sources of product failure. 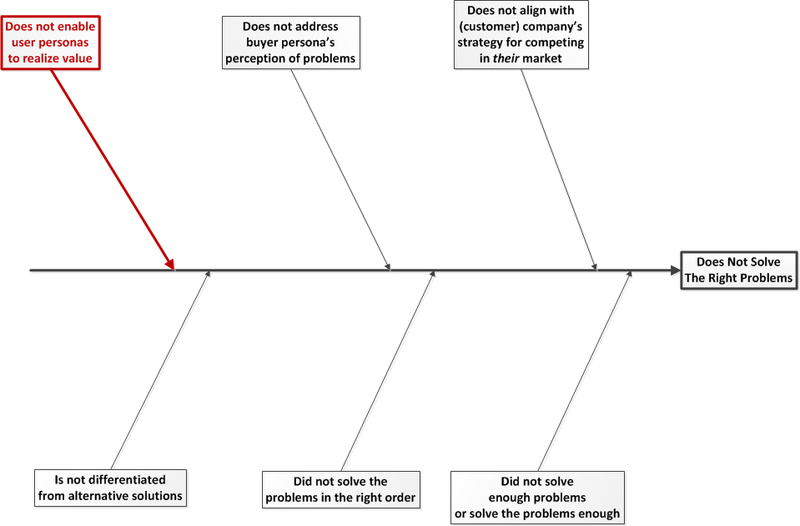 Breaking this down involves exploring why the problems are not the “right” problems to solve. One branch of the Ishikawa involves failing to solve the problems that are important to the user personas. That’s what we’ll explore in this article. 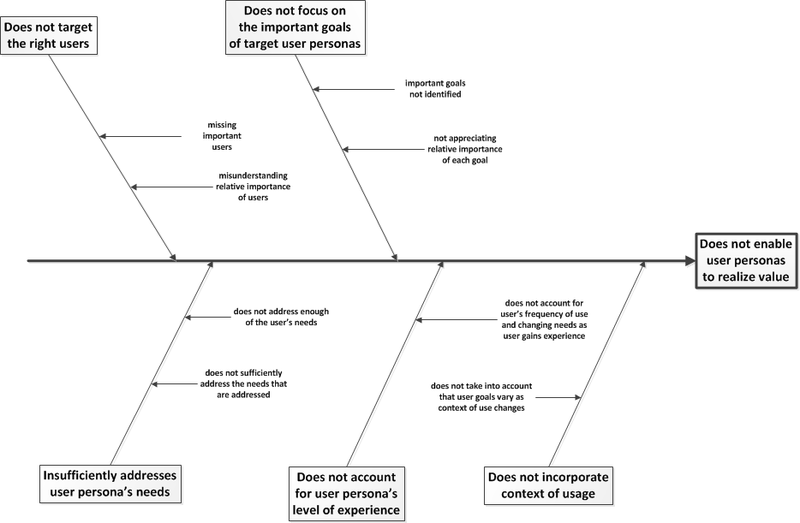 There are several ways in which you could reach the conclusion that user personas have failed to realize value. … Does not target the right users – you may have solved someone’s problems, but not the right someone. 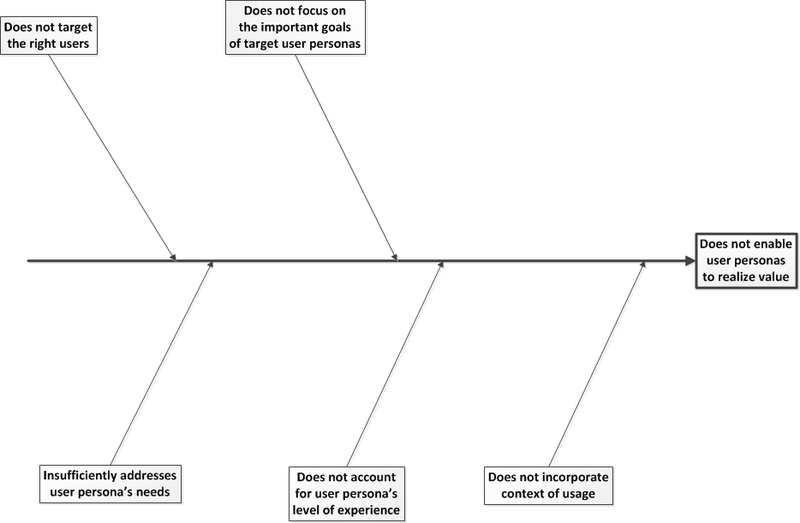 … Does not focus on the important goals of target user personas – you may have picked the right users, but you failed to focus on the most important goals that they have. … Does not account for user persona’s level of experience – as people use a product, the nature of the problems they face evolves – did you take that into account? … Does not incorporate the context of usage – solving the right problems, sufficiently, for the right people is not enough – you have to account for the context in which they care. When looking at the details under each of these categories, we get to the root causes of failing to enable your users to realize value from your product. Developing a set of user personas to guide the development of your product is important for several reasons. It provides a framework for focus – only building what is needed by the people who will actually use the product, not building what someone thinks “would be cool.” It provides a framework for prioritization – yes, some users will do that, but most won’t, so we’ll do that later. It provides context for the team to avoid a common manifestation of not having defined users – the elastic user problem. It gives you an opportunity to build a product that people love – creating loyal customers. Markets are made up of market segments, which represent groups of customers who share common problems that people will pay to solve. The notion of “customer” is combining both buyer personas and user personas to simplify the model. Many products are relatively straightforward – within a given market segment, there is only one important user persona. For many B2B and enterprise software products, there are multiple user personas who collaborate to solve business problems. You need to understand the ecosystem of how your customer operates in order to identify the user personas that are important. Sometimes, the important user personas are not the people who directly interact with the system – they can be people who “use” the outputs of the system. In an article on visualizing stakeholder analysis, I show how to use an onion diagram. As the pest control company admin, I need to be able to quickly see the history of our relationship with a customer when she calls me, so that I can deliver personalized service, so that I can improve our customer’s satisfaction with our service. As a pest control company customer, I want to know that my company cares about me, because I’m willing to pay a premium to support local merchants as long as I get personalized service. I suspect it is a matter of personal (team) preference, but I prefer treating the non-user users as first class citizens. I believe you are more likely to generate insights about the problems the user-users should care about solving, when you start getting inside the heads of their customers – a key approach to developing B2B2C products. Once you’ve identified the users, you need to identify the relative importance of each group of users. Choosing who to satisfy – or who to satisfy first is a manifestation of your go-to-market strategy. Selection of the “right” strategy is a little too broad of a topic to cover here, a thousand words into an article on user persona prioritization. As part of a series on comparing products, I made the case that you have to compare products from the perspective of users, and that the comparison should be weighted based on the relative importance of the users. In that article, I touch on market size, cross-market influences, higher-level strategy, risk mitigation, and ease of entry (into the market) as key areas of focus in strategy formulation. The methodology for weighting the comparison in the context of user goals and the relative importance of users can also be used to prioritize investment decisions in your product. Your product failed because you failed to solve the right problems. You failed to solve the right problems because you did not enable the users to realize value. You failed to enable users to realize value because you either (a) failed to identify your users, or (b) failed to prioritize solving problems for the right users. To avoid product failures that stem from these root causes, identify your users, and their relative importance in the context of your particular strategy. This aligns with what you stated, but too often, companies with early stage products are unwilling to even select a target market and try to sell to anyone that looks like a potential fit. This happens because they never did the market validation work to understand which segment has what problem, as you describe here. Thanks, Tom! I definitely just saw exactly that scenario recently.